The primary program provides a secure transition from learning at home to learning with other students. 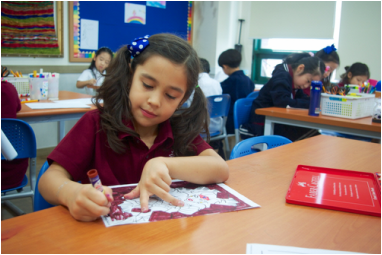 Children who enter the primary program are generally inquisitive, imaginative, active and eager to learn. They enjoy exploring, experimenting, playing and working with others in a safe, stimulating environment that promotes confidence in their ability to learn. Intermediate students progress from childhood to adolescence. They experience physical, emotional and intellectual changes. This period is characterized by fluctuations in behaviour, attitudes, social growth and development. The influence of peers has a greater effect on student actions and decision-making processes at this age. In the area of intellectual growth, students' progress from concrete to abstract thought. The secondary years focus on preparation for post-secondary studies or entry into the workforce. As courses become increasingly specialized, students continue to expand their knowledge and refine their skills in language arts, social studies, science, mathematics, technology, fine arts and applied skills. They take courses that are directed toward the achievement of their personal and career goals. Students develop advanced skills and take more responsibility for their learning.